This historic home, now a beautiful bed and breakfast, is the epitome of a Southern mansion, complete with white columns and stone accents. 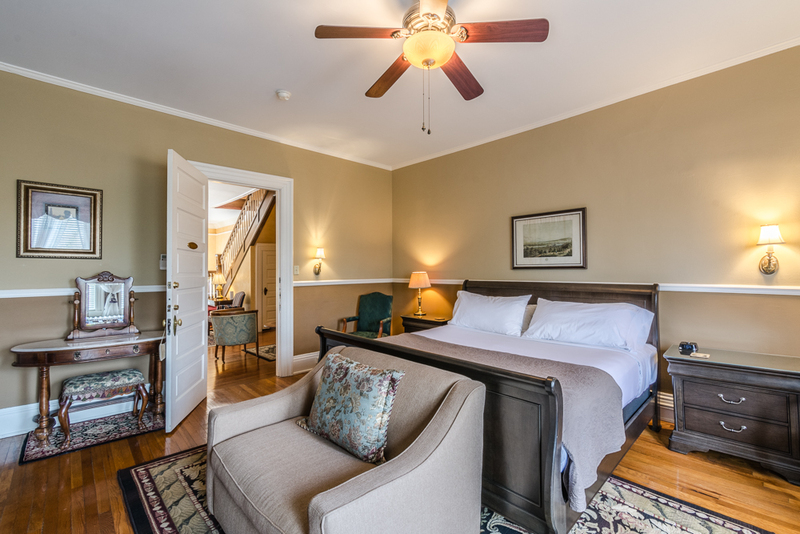 The Albermarle Inn is located adjacent to Grove Park and a mere minutes to downtown Asheville. Several rooms of this home required upkeep to preserve the home’s historic details and design. Pride Builders has taken careful attention to detail to uphold these details while adding modern amenities to the home. The Pride team built a frame structure under the front patio to support the floating slab and support the parties of people that gather on it. Additionally, attention to the front porch was paramount, from grinding down the concrete surface to refinishing the entire porch, the entrance got a makeover. In the breakfast room new Lincoln double hung windows were installed, and the room was insulated as much as possible without deconstructing too much. New trim inside and out completed the room. Showing major signs of aging, the dining room ceiling was crumbling and collapsing. The ceiling was demoed in its entirety. To create a level surface, new framing was installed and finished with new sheetrock. As a nod to the past, detailed new 5 piece oak crown molding was installed beautifully around perimeter of room. In Juliet's Chamber, the entire bedroom and bathroom were stripped down. A reconfigured layout of the bathroom, new tile shower with glass enclosure, new vanity, lighting and plumbing fixtures, created an entirely new space equipped with modern amenities. In the bedroom wall paper was removed, the plaster walls were patched and smoothed, and a fresh coat of paint, new chair rail and new carpet finished off the room. The second floor foyer required demo to the crumbling plaster ceiling, installation of a new sheetrock ceiling and 3 piece crown molding.